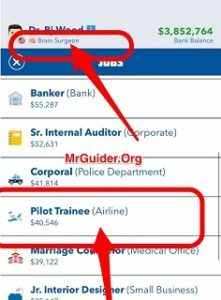 BitLife – Life Simulator – How To Become Pilot And Airline Captain? The player needs to apply for a pilot trainee job to get into the pilot and airplane captain career. But the main challenge is to get approved for the pilot-trainee job. There are a couple of things you need to take care of while applying for the pilot trainee job. 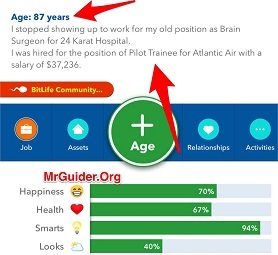 Once you get into the pilot job and progress a bit, the BitLife – Life Simulator will promote you to co-pilot, then the pilot, and then you will eventually grab the Airline Captain post. It is one of the 63 achievements in BitLife – Life Simulator. In today’s post, we will help you get into the pilot career. It merely takes 5 minutes! Let’s get started – BitLife – Life Simulator Pilot Walkthrough – How to become pilot and airline captain! 1⇒The very first point is to start strong. We all know that the player gets a random virtual character; country, parents, sisters, brothers, parents’ age, and the stats. When you start a new life, pay attention to the character’s attributes; smartness, happiness, and look. Looks, health, and happiness do not matter a lot. Especially, Looks(In pilot career). But your character must be smart enough to get an interview for the pilot trainee job. If the smartness points are over 85, then continue to the second step. If not, we would strongly recommend you start another new random life until you get a smart character. It is obvious that no company would ever recruit a dumb character. 2⇒Graduate from high school. While studying in high school, you can go to the library and maintain the smartness stats. The player, after getting graduated from high school, needs to apply for university/college in a particular subject. To become a pilot in BitLife – Life Simulator, you need to get into the medical school. That’s weird, but it’s true! So we would recommend you to choose Biology or Psychology as the main subject. Study hard every year, visit the library and keep the smartness at its peak. 3⇒After graduating from the university with an undergraduate degree in one of these subjects; psychology or biology, apply for the medical school. If the character’s smartness stat is good, you will get into the medical school without any problem! (Tap the occupation button -> education -> medical school). 4⇒Study hard while in medical school. And, graduate from medical school. Don’t forget to visit the library. 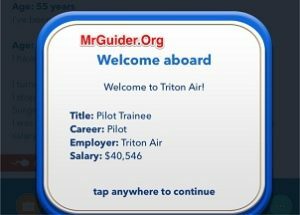 So this is the first part to become a pilot and an airplane captain in BitLife – Life Simulator. Let’s head to the 2nd part! Once you are graduated from a medical school and have good smartness stats, all you need to do is apply for a pilot trainee job. You will definitely get approved. But the problem is there is no guarantee that there would be a vacancy for pilot trainee job right after you graduated from medical school. If the pilot trainee job is not available, apply for the surgeon job and work there for a year. After a year, tap the job button -> browse other listings -> look for the pilot trainee job. In BitLife – Life Simulator job listings get changed every year. So we would recommend you to check the job vacancies every year. Tap the age button -> tap the job button -> browse other listings -> look for the pilot trainee job -> apply it if available -> repeat this step if not available. As you can see in below pictures; In the first one, it is clearly visible that character is a surgeon and pilot trainee job is available. This post got available at the age of 56. In the second picture, you can see that the character got a pilot trainee job at the age of 87. So it depends on luck. You have to keep patience; get into the medical school -> apply for a surgeon job(if the pilot-trainee job is not available. If available, apply for it) -> check the job listings every year and look for a pilot job -> it will come eventually. After getting approved for the pilot trainee job, all you need to do is work hard(tap the job button -> work hard). You will get the promotion; pilot trainee to Co-Pilot, Co-Pilot to Pilot, Pilot to Airline Captain. Keep in mind that this is not the only way to become a pilot or Airline Captain. If you are lucky, you may get approved for the pilot-trainee job after graduating from graduate school(With Engineering qualification) or Join air force in the military -> then apply for Pilot Trainee. But the walkthrough we shared above is the best; works 99.99%. If you have any other walkthrough, let us know in the comment section below!